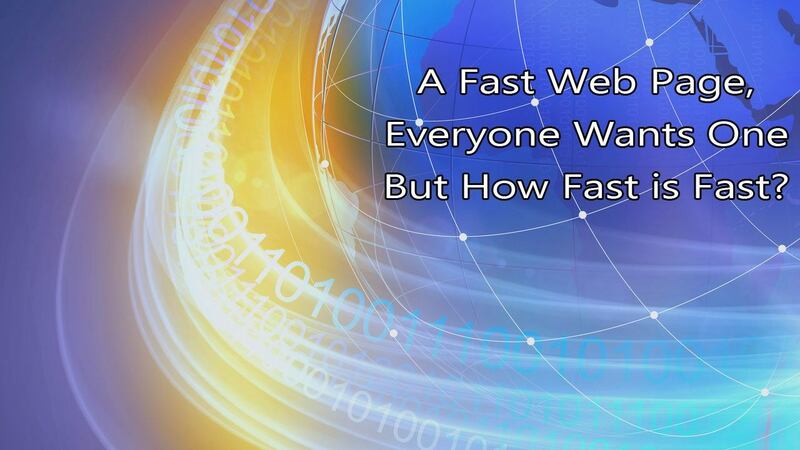 A Fast Web Page, Everyone Wants One But How Fast is Fast? As we saw in the previous installment of this series, there are a lot of very good reasons to have a fast Web site. When it comes down to it, a fast Web page makes for a better user experience and that leads to many desirable things like more traffic, higher conversion rates, and more sales. When people talk about a fast Web page they really mean how fast a Web page is displayed when a link is clicked or a Web address (URL) is entered in the address bar. The perceived time it takes to show the page and make it usable to your site visitor. That is, the time the page looks to be loaded and usable even if there are still things not on the visible portion of the page that are loading. Rarely is the time that elapses on a clock the same as the perceived time in the visitor’s mind. The important thing to focus on is the second one although improving the first type of time usually improves the second one. But how fast is fast and what is fast enough? Other research from MIT shows that any response less than 1 second keeps the flow of thought uninterrupted.2 This helps keep your site visitor fully focused and engaged with your page. The response time for an optimal experience changes depending upon various things but the average site visitor’s primary concentration and attention lasts from 2 to 5 seconds. That’s a main reason why 2 seconds or less has long been considered the optimal page-loading time. In addition, recent research shows that attention spans have shrunk by 50% since the turn of the century and you might have as little as four seconds before a site visitor leaves your site. As mentioned above, the important thing is the perceived speed, but the actual “clock” speed can have a big impact on the perceived speed so we’ll look at some of the important things to measure. However, there are several important things to understand when you measure page speed in that context. A Web page is a lot more complex than it may seem on the surface and the more requests there are, and the more requests to different “domains”, the slower a page will be to load, in general. There are techniques that can be used to mitigate the impact of lots of requests so that the perceived speed remains fast while the actual page load speed is longer. Therefore, one powerful way to have a fast Web page is to have fewer requests. Every request made receives at least one response, and many times more than one response, from the Web servers that handled the various requests. After the Web browser completely receives the responses to each request it must do something with them. If the request is for a Web page, then it must figure out what the HTML programming code says for the page to do and start doing that. If the request was for an imag,e it must preview and display the image at the right size in the right place on the page. If the request was for a CSS styling file, it must figure out what the styling says to do and modify the Web page to use the specific styling commands in the file. These can include background colors and images, what fonts to use for text, what size and color to display the text in, where to place specific items on the screen, etc. There are a myriad of things that can cause slow WordPress sites; some you can control and some you can’t (like issues with the Internet itself). Generally, there is not one thing that will cause your site to be slow but a combination of things contribute to turning a fast Web page into a slow page that people click away from. There are many reasons why a Web page is slow and there are even more solutions to overcome, or at least mitigate, those reasons. However, a key reason for slowness is the growth in the “size” of the average Web page, which is from the greater use of graphics and video. 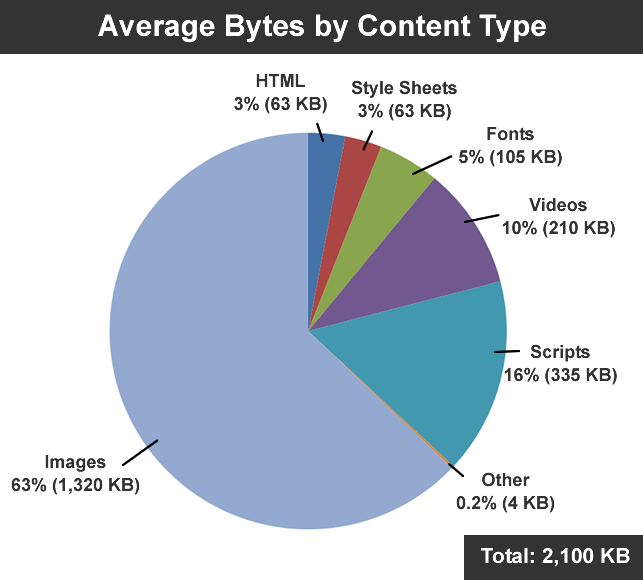 The latest research I saw, as reported by CNN, showed that the average Web page is 2.1MB in size and is broken up into various types of resources, as shown in the figure; this is over 6 times larger than the 320KB that was the average page size back in 2009; notice images and video make up 73% of the “size” of the Web page. The perceived speed of a Web page is intimately tied to the actual displaying of the page content. The faster people see the page content the faster they will think the page loads; this is true no matter how long it actually takes the page to load. So, in addition to actually speeding up the page, many ways to speed up a Web page is to remove every thing that slows down the rendering/displaying of the page but that is a complex subject and well beyond the scope of this article. One interesting fact related to changes in the speed of a Web page is that, according to the Weber-Fechner Law, Web page performance won’t be noticeable unless the change is about 20% or more, one way or the other; this is a simplification of the law but is a generally realistic figure. Of course, the bigger the change the more noticeable it will be. In a future installment we’ll take a look at many of the ways that can slow down Web pages and some solutions you can use to speed them up and get a blazing fast Web page. This article is excepted from my soon to be published book: Money Loves Speed: The Ultimate Non-Techie Guide to Turbocharging WordPress.